Kensington Publishing Corporation, 9781617739415, 464pp. In the timeless tradition of Colleen McCullough's The Thorn Birds, Harmony Verna creates a poignant, beautifully told story of love and courage, set in Australia and America in the early decades of the twentieth century. The desert of Western Australia is vast and unforgiving. It's a miracle that the little girl dressed in rags and abandoned in the sand is still breathing when an old miner discovers her. He keeps her alive long enough to bring her to the town from which she'll take her name: Leonora. Sent to an orphanage, she slowly bonds with another orphan, James, who fights to protect her until both are sent away-Leonora to a wealthy American family, James to relatives who have emigrated from Ireland to claim him. Years later, Leonora is given a chance to return to her beloved Australia. There, in Wanjarri Downs, she will again come face to face with James, who's grown from a reticent boy into a strong, resourceful man. Only James knows the truth about Leonora-that her roots and her heart are here, among the gum trees and red earth. And they will fight to find a way back to each other, even as war, turmoil, and jealousy test their courage again and again. 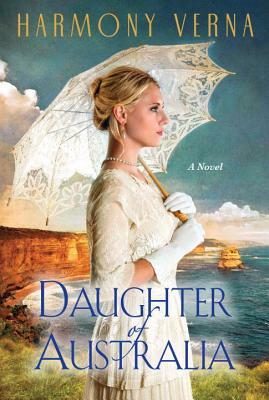 "A beautiful, heart-wrenching story set at the turn of the twentieth century, Daughter of Australia is a compelling read " -Ellen Marie Wiseman, author of What She Left Behind "A captivating story of love and the search for identity. A mesmerizing debut novel." -Kristina McMorris, New York Times bestselling author of The Edge of Lost. Throughout her twenty?year career in communications, Harmony Verna has worked with all media facets: radio, television, magazines, newspapers, public relations, advertising and marketing. As a freelance writer, she has written scripts for the Food Network and articles for Modern Bride Magazine, Connecticut Woman Magazine and more. Daughter of Australia was a final round selection for the James Jones First Novel Contest. Verna lives in Newtown, Connecticut, with her husband and their three young boys.